Using WordPress to create a website is fast and easy. The Internet is a quickly growing place. People from all over the world have started their own blogs and websites. Some people have even managed to make quite a good living by running their own site. While creating a website used to require a lot of technical knowledge, it’s now easier than it’s ever been before. Anyone with some basic computer skills can start a dynamic, attractive and popular website in only a few short minutes. There are plenty of different ways to do this but the most popular option, by far, is WordPress. WordPress is a blogging platform but it can also be called a content management system. Basically, WordPress is a program which allows anyone to create great websites with a minimum of effort. Nearly every aspect of a WordPress site is customizable and there are literally an endless number of different ways to make it unique. Part of the reason it’s so popular is that running a website on this platform is incredibly simple. It makes posting new content, managing comments and adding new pages, links, images and videos a breeze. The best part about WordPress, however, is that it’s completely free. A content management system, often called a CMS, is simply a computer system which makes running a website much easier. It used to be that a webmaster had to sort through files on a server and edit code simply to post new content or media on their site. The advantage of a CMS is that allows a webmaster to manage almost every aspect of running a website from one central location. Most content management systems will have a very intuitive interface which allows a webmaster to add new content, or edit and manage existing content, with only a few clicks. A WordPress theme is something that determines the look, style and layout of a WordPress site. Themes can either be simple or extremely complex. Many modern themes will not only determine the layout of the site but will also do things like change fonts and add more dynamic functionality. While WordPress comes with a built in basic theme, most website owners will install one which is more attractive and useful. Themes can be found in a number of places and they’re incredibly easy to install. WordPress even grants the ability to store multiple themes and switch between them with a few clicks. A WordPress plugin is something which adds increased functionality to a WordPress site. Plugins can be created to do almost anything whether it’s visible to the user or not. They are a great way to further increase the uniqueness of a site and tweak it to perfectly fit the needs of the site owner. There are literally thousands upon thousands of different plugins designed to work with WordPress. The best part is that many of them are free while the premium plugins are truly impressive and can help create a dynamic, professional site with very little effort. What about WordPress as a Business Website? Creating and running a website used to involve a lot of hassle and required a fair bit of technical experience. Things have changed quite a bit over the past few decades, however, and it’s now possible for nearly anyone to create a wonderful site in a short period of time. 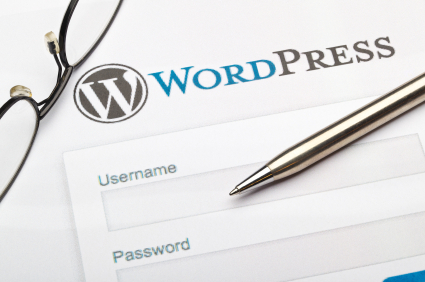 WordPress is the most popular content management system and blogging platform for good reason. Its ease of use, coupled with its capability for endless customization, has made it a favorite option among webmasters all over the world. WordPress is completely free and many hosting plans will allow someone to install it with the click of a button. Anyone looking to start a business website of their own would be well advised to use WordPress.